Deciding on the best router bits for your wood shop is not an easy task. There is a huge range of bits available and it can be quite intimidating even for the most experienced woodworker. Investing in a good router bit set from the start doesn't mean buying the most expensive set available. Buy what you need and will be using the most often. Over time as your skill and needs increase you can start to purchase the more specialized bits. ​These bits are intended for hand-held or table-mounted portable routers. They have also been tested for use at the highest speeds, exceeding the 22,000-RPMs delivered by most portable routers. ​The 13-piece router bit set includes a variety of the most commonly used bits. They also come in a beautifully-crafted wooden shadow box that you can mount on the wall. However, the greatest advantage is the quality of the bits. The bits are tipped in a long-lasting carbide-titanium material that was created and patented by Freud. This material offers more durability, ensuring that these bits last through many woodworking projects. Each bit is also computer-balanced to limit vibration and chatter. They also feature tri-metal brazing and an anti-kickback design. These details help make this one of the top sets of bits available. While there are no major disadvantages to this set, some people may not enjoy the price. As with most products, you need to spend more to get the best quality. Why Should You Consider Getting the Freud 13-Piece Set? This 13-piece super router bit set from Freud may cost a little more than some other options. However, the bits are worth every penny. You get high-quality router bits that can withstand heavy-duty applications and regular use. You also get a nice selection of bits of varying sizes and styles. The variety of bits makes this a top choice for beginners looking to get started in carpentry. In the end, the Freud 91-100 13-piece super router bit set includes some of the best bits that money can buy. This is considered a budget set of router bits, as they are not built for strength. However, they do have a 1/2-inch shank, which makes them more durable than some of the other budget sets. The top benefit of this set is the variety of bits. You get 30 pieces, offering enough choices to suit almost any type of project. You get the cove bit, flush trim bit, dovetail bit, 45-degree chamfer bit, five straight bits, and many more to choose from. The storage box is also a nice feature. It holds the bits in place, with each spot clearly labeled. The label includes the size of the bit and an illustration of the cut. The bits are also backed by a three-year warranty against defects. This does not mean that you can get your bits replaced when they break. However, if you notice any flaws or defects, you should have no problem getting a replacement. These are not professional quality router bits. They are mostly intended for amateur woodworkers that need a variety of bits to start their first woodworking projects. The bits are well made. They offer precision and balance and work with most routers. However, they are unlikely to hold up to repeated use. Luckily, they are affordable. You get a great selection of useful bits. If one breaks, you can likely find a substitute within the set. When you need a set of various bits at a reasonable price, consider getting the MLCS 8369 carbide-tipped router bit set. The main construction features hardened solid alloy steel, along with a powder coating for increased durability. The bits are stored in an aluminum case, with labels for each of the bits in the set. The Neiko 10115A is one of the most versatile sets. It includes 80 pieces, which is more than most hobbyists will know what do with. While there is a good chance that you may not use every bit in the set, at least you have a wide variety of options. The bits also have a 1/2-inch shank, which is used by most routers and increases the thickness of the bit. However, these are not the most durable bits available. While the main construction material should hold up to repeated use, the carbide tips may start to wear quickly. Another issue is the durability of the case. The aluminum case dents easily. This is a minor inconvenience more than a major drawback, as the case does not affect the performance of the bits. The Neiko 10115A Premium Tungsten Carbide router bit set offers the best value for your money. You get 80 bits, including the bits that you will likely use most often on your woodworking projects. While the bits may start to wear quickly, you get multiple bits of the same size and shape. The Neiko 80-piece set is best suited for beginners or those that need to have a wide variety of bits available when needed. Tongue and groove bits are two of the most useful bits in woodworking and joining. However, you may need a variety of bits for different sized cuts. The tongue and groove bits are commonly used when cutting to create a joint. With adjustable bits, there is a small dial that you adjust to change the height and width of the tongue or groove. This allows you to use the bit for different cuts without having to switch bits. These are the best tongue and groove bits that money can buy. The precision and balance are hard to match, thanks to the quality manufacturing processes used by Freud. You should not need to replace either bit for some time, even when cutting through tough materials. The quality of the bits is also backed by a lifetime warranty by the manufacturer. The company stands behind their products, which is another reason to consider spending the extra money on durable bits such as these. When you purchase the specific bits that you need for a project, you can take the time to find the best option. For tongue and groove bits, this set from Freud is the top choice. These quality bits feature patented TiCo high density carbide tips that are unlikely to wear. They are also adjustable, eliminating the need for multiple tongue and groove bits. The bottom line is that the Freud adjustable tongue and groove bit set is another example of why Freud is the leading manufacturer of router bits. The 15 bits include the bits that you are most likely to need during your woodworking projects. You get four straight bits, along with a cove bit, rounding-over bit, V-groove bit, and a flush trim bit. The set also includes a bearing to convert the round over bit into a beading bit. All the pieces fit perfectly in the provided wood storage box. The primary advantage of the MLCS 6077 Woodworking Carbide Tipped bit set is the value. You get 15 pieces at a low price. When using budget bits such as these, you should not expect them to last forever. They are built to provide precise cuts until the carbide tip starts to wear. Depending on the type of material that you use and the frequency of use, they may start to wear within a few days or a few years. You may also end up with a few broken bits if you use them for heavy duty cutting projects. However, you are not spending a lot on this set, so a broken bit is not a major problem. Who Should Consider Getting This Router Bit Set? The MLCS 6077 woodworking router bit set is meant for beginners. The manufacturers even describe this set as the perfect all purpose starter set, which is an accurate description. They are not the lowest-quality bits, but they are not high-end bits either. If you want professional-grade bits, you need to spend more. However, the low price provides a good entry point for anyone that is just learning how to use a router. Like most router bit sets, these bits are suitable for use with a handheld router or a router table. They also feature the standard 1/2-inch shank, which provides more durability compared to the 1/4-inch shanks. The bits that come with this set include the cove bit, rounding-over bit, rabbeting bit, 45-degree chamfer bit, straight double flute bit, flush trim bit, and a 1/4-inch straight bit. The Whiteside router bits have received a lot of positive comments from customers, comparing them to the bits manufactured by Freud. In fact, professionals often use Whiteside router bits, as they tend to cost less than Freud router bits while still offering similar quality. The main benefit is the durability of the bits. They hold up to regular use and are suitable for high RPM cutting. While these bits are not as expensive as the Freud bits, they are still more expensive than most of your other options. A beginner woodworking hobbyist may not want to spend the money on these bits without first testing out a less expensive set of bits. If you do not want a budget set of router bits and do not want to spend the money on the highest-end option, the Whiteside router bit set is a perfect choice. The bits are durable, balanced, and sharp. They should hold up to repeated use, no matter what material you are cutting. 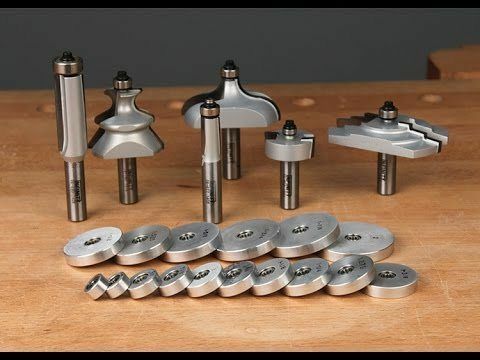 Overall, the Whiteside 401 7-piece router bit set is a fantastic option for hobbyists or professionals that want a solid set of bits that should last for many years. The manufacturer recommends that you do not use these bits with speeds exceeding 30,000 RPM. However, most handheld routers have a range of 8,000 to 24,000 RPM. Unless you are using these bits in an industrial setting, you should not have a problem with this limitation. These are quality bits and suited for regular use without noticeable wear and tear unless you use them regularly on harder materials. They have been carefully crafted for balance and precision and feature the standard carbide tips. If you need to find a drawback, it is the selection of bits. You do get two straight router bits. However, the remaining four bits are not the most commonly used bits. You get a piloted beading router bit, corner rounding bit, core box bit, and a chamfer router bit. The cost per bit is right in the middle compared to other brands. You are getting six quality bits that are suitable for a wide range of uses, including heavy duty renovation work. The durability of these bits makes them suitable for professional work or DIY woodworking projects and home renovations. However, they may start to wear or break when used regularly on hardwoods. In the end, these bits are great when working with soft materials. You can use them for inlaying and mortising. The only major drawback is that this set is not versatile. You get a limited set of bits that are primarily intended for a limited set of projects. ​The 24 pieces fit nicely in the provided wooden storage case. Each slot includes the name and size of the bit, along with an outline of the type of cut that it is used for. The bits feature 1/4-inch shanks. The 1/4-inch shanks may not be as durable as 1/2-inch shanks, but the smaller size reduces the cost of the bit set. This set from Stalwart has two main advantages. The top advantage is the price. This is one of the most affordable sets when considering the number of bits that you get. You get 24 pieces, including an Allen wrench for removing bearings, giving you a variety of bits for a variety of woodworking projects. As you might expect from the price, these are not the most durable bits. The manufacturer does not list the material that was used for the main construction of the bits. They simply list the carbide tips, which are found on most economy bits. While they are durable enough for working on soft woods, these bits may break when cutting through harder woods. Should You Get This Router Bit Set? Overall, this is a great starter set. You get a nice selection of bits at a low price. However, it may not be the right product for a serious carpenter looking for bits that can withstand heavy-duty use. While the main material is not very durable, the bits should provide enough use for those that are just getting into woodworking and do not want to spend a lot on a decent set. The Hiltex 10100 Tungsten Carbide 15-piece router bit set includes many of the features that you expect from a standard bit set. The bits feature tungsten carbide tips and are constructed from hardened alloy steel. While the bits feature the most commonly used materials, they do hold up nicely when working on softwood. The limitations of these bits start to show when the material hardens. With hardwood, do not be surprised if one or more of your bits breaks or wears after several uses. The bits have a 1/4-inch shank. While you can typically use 1/4-inch or 1/2-inch shanks with most routers, the smaller shanks result in thinner bits that may break more easily. However, the 1/4-inch shank is also one of the reasons that this set is affordable. These bits are not the most durable. However, they do cut well. They are balanced and sharp enough for most tasks. You may only run into issues when cutting hard materials. There are no major strengths or drawbacks to this set. However, it does stand out from some of your other options due to the price. This is one of the least expensive sets for beginners. You should keep in mind that this is a budget set. You are not getting the highest-quality bits, but you are getting great value. If you just need a few basic bits to start experimenting with woodworking, consider starting with this set from Hiltex. Copyright text 2018 by Woodworkers World.